All You Have Got is Thyme- Superfood of the Week! Thyme is one of my most favorite herbs! Its easy to grow, mild and aromatic and it is sooo good for you. Where did this culinary delight come from? For thousands of years, thyme has been a superstar of the herb garden. As an antidote for poison, a plague preventative, a symbol of bravery in battle and a stalwart companion to the grave, thyme has a far more storied past than you’d think if you were walking past it in the supermarket today.Thyme’s reputation as a healer and protector goes back thousands of years. In the Roman era, it was widely held that eating thyme either before or during a meal would protect you from poison. For obvious reasons, this made the herb a particular favorite of the emperors. It was even said that a bath in warm water liberally dosed with thyme could stop the effects of poison after it was inadvertently consumed. Thyme is an herb from the mint family that you probably recognize from your spice set. But it’s so much more than an after-thought ingredient. Its range of use is impressive, and it has over 400 subspecies. Ancient Egyptians used it in their embalming practices, while ancient Greeks used it as incense. Thanks to its distinctive taste, thyme has remained a culinary staple to this day. 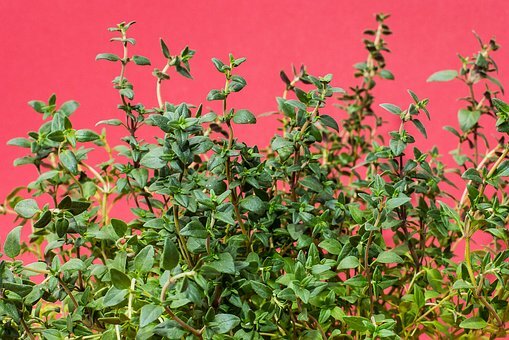 But thyme is also fast gaining a reputation for its medicinal qualities, such as its ability to help treat acne and high blood pressure. One of the most well-known and long-standing uses of thyme in traditional medicine is as a respiratory agent. If you are suffering from bronchitis, chronic asthma, congestion, colds, flu, blocked sinuses or seasonal allergies, thyme acts as an expectorant and an anti-inflammatory substance. It eliminates phlegm and mucus from the respiratory tracts, eases inflammation to help breathe, and prevents microbial development that can lead to illness.In fact, a study conducted in Spain showed that thyme extract oils have anti-inflammatory effects. That’s why brewing thyme into a powerful tea is one of the best ways to achieve relief from respiratory ailments. With one of the highest antioxidant concentrations in any herb, thyme has been praised for thousands of years as an overall health booster. The phenolic antioxidants found in thyme, including lutein, zeaxanthin, and thymonin contribute to neutralizing and eliminating free radicals throughout the body, according to a Korea Food Research Institute study. Free radicals are the dangerous by-products of cellular metabolism that can do major damage to your healthy cells by causing apoptosis or spontaneous mutation. These antioxidants help prevent oxidative stress present in your organs, as well as your neural pathways, heart, eyes, and skin. The rich blend of antioxidants, minerals, and vitamins in thyme have many small effects on the heart, but potassium and manganese are particularly important. Potassium is a vasodilator, meaning that it can reduce the stress on the cardiovascular system by relaxing blood vessels and lowering blood pressure. A study in the UK found that laboratory rats whose diets were supplemented with thyme oil showed a stronger activity level and higher antioxidant levels during their lifespan. This can extend your life by preventing atherosclerosis and avoiding strokes, heart attacks, and coronary heart diseases. This herb is hearty, easy to grow in gardens or pots and you can cut wash and use!